Source Naturals Hyaluronic Joint Complex is a product designed for adults who want to maintain an active lifestyle, as well as athletes who need to look after old injuries. Also, people who live a sedentary lifestyle can benefit from this supplement, as the manufacturer indicates. Based on powerful ingredients with a proven role in combating joint pains and discomfort, Source Naturals Hyaluronic Joint Complex can be a great ally for providing you with more flexible and healthier joints. Let’s see what this supplement contains and how it can help you achieve better health for your joints. 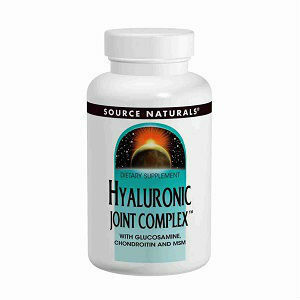 What Does Source Naturals Hyaluronic Joint Complex Contain? As you can see, the complex contains a lot of efficient ingredients for treating joint pains and improving mobility. Particularly, glucosamine sulfate, hyaluronic acid and chondroitin sulfate are three important compounds that help the body rebuild the lost cartilage and provide it with the necessary building blocks for it. The manufacturer recommends taking two tablets daily for best results. Since it contains shellfish, it may trigger allergies, so make sure to consult your doctor before starting to take this supplement. The product is sold as 30, 60 and 120 tablet bottles. The 60 capsule bottle costs 31.50USD and it lasts for one month. There is no clear sign about a money back guarantee being offered on the official website. However, you can contact the company about any issues, using the contact details offered there. Source Naturals Hyaluronic Joint Complex combines the effects of hyaluronic acid, with other powerful ingredients for promoting joint health. It contains glucosamine, chondroitin sulfate and MSM, all important compounds to treat aching joints. Also, because it is based on hyaluronic acid, it is a formula that is most likely to produce results. However, there are certain herbs and minerals that are not present, and a money back guarantee is not offered, downsides that cannot be ignored. Mark Stevens	reviewed Source Naturals Hyaluronic	on December 31st	 and gave it a rating of 2.5.